First report of field bindweed (Convolvulus arvensis L.) penetrates the roots of pepper (Capsicum annuum L.) plants. Citation: Farag FM. First report of field bindweed (Convolvulus arvensis L.) penetrates the roots of pepper (Capsicum annuum L.) plants. J Agric Sci Bot 2018;2(4):7-11. Bindweed (Convolvulus arvensis L) is a root competitor weed that represents a major constraint for several crops production all over the world. Bindweed has adopted a parasitic lifestyle on pepper plants (Capsicum annuum L) in Egypt. Parasitic plants develop a multicellular infectious organ called a haustorium. In March 2017, 42 samples were collected from Minia and Beni Suef governorates, Egypt and evaluated for their virulence against pepper plants. Pathogenicity test was carried out in Sids Research Station. These populations tested were able to attack the pepper roots (Balady variety) appearing polar and dwarf leaves compared to leaves of uninfected control plants. The histological studies of Convolvulus arvensis and pepper roots revealed that the vascular xylem of the bindweed primary and secondary haustoria eventually connected with phloem conducting elements of the host root. By using the light microscope, boundary features of the penetration site and connection of the secondary to the primary root (in healthy pepper plants) were compared histologically with those of the haustoria and the host root cells (in infected pepper plants). These findings are important in assessing the potential of the parasite as an agronomically significant pest in Egypt. Bindweed, Convolvulus arvensis, Pepper, Capsicum annuum, Haustorium, Pathogenicity. Sweet pepper (Capsicum annuum L.) belongs to the family solanaceae  which is an important group of vegetables cultivated extensively in Egypt and also widely cultivated in almost every country of the world. This genus originated from Central and South America . From America where numerous species were used centuries before Columbus landed on the continent , the cultivation of peppers was spread throughout Europe and Asia after the 1500s. Although perennials, they grow as annuals in temperate climates. They are sensitive to low temperatures and are relatively slow to establish. Greenhouse production provides most of the local source of this product. Pepper fruit (berry) is one of the most important sources of vitamin C. In addition, it contains vitamins B1, B2, B3 and carotene, organomineral compounds, organic acids and sugars . So for this quality, it used in cooking and prevention of many diseases (cardiovascular diseases, kidney diseases, anaemia, strengthening the immune system, etc). Dander of pepper comes from the alkaloid capsaicin, which speeds up the metabolism and is used to reduce weight and for cleansing the blood from triglycerides . Convolvulus arvensis is one of the world’s top noxious weeds and it is found in 32 different crops in 54 countries . Convolvulus arvensis L. (Convolvulaceae), field bindweed, is a perennial herb. Its deep and extensive root system, together with its long-lasting seed bank, is a key feature to the noxious weed status that it receives worldwide . Convolvulus arvensis is native to Europe and Asia, and it grows in temperate, tropical, and Mediterranean climates . Crops suffer enormously from field bindweed which competes for nutrients and water  and harbours parasitic fungi . Growth and yield of pepper are substantially reduced by weed competition for nutrients, water, and light. Yield reduction depends on multiple factors, including weed species, weed density, time of weed emergence relative to crop emergence, weed distribution, soil type, soil moisture, pH and soil fertility level . The relation between pepper plants and bindweed was developed more than competition to parasitism, which the present work was planned to shed light on it. Bindweed infected pepper plants of nearly similar ages were collected from Minia governorate (Maghagha, Beni Mazar and Mattai counties) and Beni Suef governorate (El-Wasta, Nasser, Biba and El-Fash counties). Under natural field conditions, where bindweed is wide spread, the experiment was conducted at the farm of Sids Agricultural Research Station using pepper cultivar (Balady). Soil preparation was conducted according to local practices for pepper production. The soil was chisel plowed, followed by a disk harrow, and finally by a harrow to obtain a smooth seedbed. Two methods of pepper planting were used, i.e., sowing seeds and transplanting seedlings planting with planting distance (20, 30 and 40 cm between plants inside row) were sown in Nile season in 2017 and were evaluated against disease incidence and some pepper plant characteristics were measured (fresh weight (g/plant), plant height (cm), number of branches, number of nodes/ plant, internodes length (cm), dimension of leaf length and leaf width (cm). Pepper seeds were sown in 10.5 m2 (3.0 m by 3.5 m) plots with 70 cm spacing between rows. At the time of sowing, 420 g/plot N, 420 g/plot, P2O5 and 420 g/plot K2O were applied to the field. When pepper plants reached 60 cm height, 30 kg N ha-1 were applied as ammonium nitrate. Fields were irrigated as necessary. Check plot were kept weed free to determine the effect of weeds absence. The experimental design was a split plots design with three replications. Pepper was hand harvested at full maturity to assess the fresh weight of fruits and some plants were uprooted to determine plant parameters and disease incidence. For microscopic examination, specimens were killed and fixed for at least 48 h. in F.A.A. (10 ml formalin, 5 ml glacial acetic acid, 35 ml ethyl alcohol 95%). The selected materials were washed in 50% ethyl alcohol, dehydrated in a normal butyl alcohol series, embedded in paraffin wax of melting point 560°C, sectioned to a thickness of 20 micron, double stained with safranin and fast green, cleared in xylene and mounted in Canada balsam . Slides were analyzed microscopically and photomicrographed. The obtained data were statistically analysed using the Analysis of variance; data were performed with a computerized program (MSTATC) according to the procedure described by . Survey of disease incidence was carried out in pepper plantations during 2017 at two different governorates. Some counties representing the three governorates located at Middle Egypt, i.e. Minia and Beni Suef were chosen to conduct this survey. The inspected counties were Mghagha, Beni Mazar and Mattai (Minia governorate), and four counties representing from Beni suef governorate, i.e. El-Wasta, Nasser, Biba and El- Fashn. In this respect, disease icidence was recorded as mentioned under Materials and Methods. In general, the percentages of disease incidence during 2017 season were much higher on pepper plants. Observations showed that bindweed has occurred on late-sown pepper crops in most months of the year. Data obtained during 2017 revealed that the highest infection on pepper was recorded at Mattai (Minia governorate), and El- Fashn (Beni Suef governorate), which recorded 25.67 and 21.56% respectively. Results of survey for infected pepper fields stated that the most prominent ones were associated with bindweed. However, data presented in Table 1 reveal that the minimal severe infection by bindweed on pepper plants was recorded at Nasser and El- Wasta (Beni Suef governorate), which recorded the lowest infection, 3.78 and 9.33%, respectively. Table 1. Survey of pepper infection by bindweed under field conditions at two Egyptian governorates with seven counties during 2017 growing season. Pepper plants raised from seeds were more likely to be attacked by bindweed than the transplanted seedlings as shown in Table 2. Data showed that disease incidence was increased by decreasing planting distances up to 20 cm which recorded the highest score, 14.33% compared with 40 cm distance which scored 8.00% for seeds sowing. On the other hand, transplanting method recorded decrease in disease incidence at 40 cm compared with 20 cm distance which scored 3.67 and 9.00% respectively. These treatments affected the fresh weight of the fruits, which recorded 115.00 g plant at 40 cm distance which confirmed the best method for planting by transplanting and 40 cm distance for decreasing disease incidence. Table 2. Effect of agriculture methods and planting distance on bindweed infection percent and fruits fresh weight. Data in Table 3 cleared that the differences between sowing by seeds and planting by seedlings methods and planting distances and their effect on plants characteristics (Plant height, number of Branches, internodes length, length of leaf and width of leaf). Data revealed that, there is significant difference between planting methods and plant height, internodes length and number of nodes. On the contrary, the number of branches and leaf width showed no significant differences due to planting methods. Table 3. Effect of planting methods and planting distance on some pepper characteristics, plant height, number of branches, number of nodes, internodes length, length of leaf and width of leaf. Relation between bindweed and pepper plants appears bindweed penetration to pepper roots as shown in Figure 1 causing the harmful effects to the roots, causing tumours on the roots. However, the infection is normally not seen above the soil and the first visible symptoms usually appear on the lowest leaves on old plants. Figure 1. 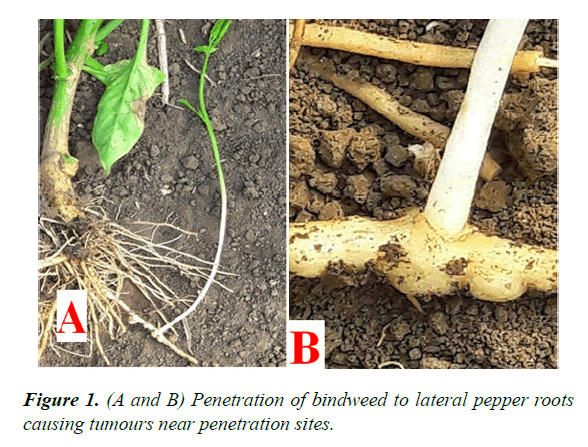 (A and B) Penetration of bindweed to lateral pepper roots causing tumours near penetration sites. Invasion of pepper tissues is a key step for the parasite because natural barriers to penetration exist even in susceptible hosts. The bindweed displays a wide array of tools to overcome the intrinsic resistance present even in a compatible host. Once the parasite has established contact with the pepper root, arguably the most important phase takes place: penetration into the pepper tissues and establishment of vascular connections (formation of the functional haustorium). 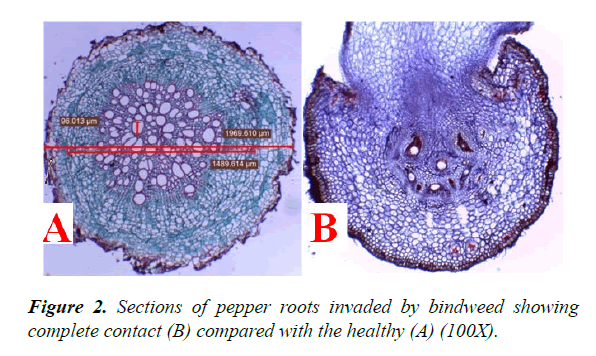 Figure 2 showed that penetration of bindweed haustorium through the lateral roots of pepper at the connection point appear in contact with xylem and phloem tissues of pepper (B) compared with the healthy tissue (A). Figure 2. Sections of pepper roots invaded by bindweed showing complete contact (B) compared with the healthy (A) (100X). The bindweed haustorium paths several developments steps through pepper roots tissues, showed in Figure 3. The sections show the xylem tissue of the primary haustorium in the cells. Figure 3. (A-F) Cross sections through pepper root showing the steps bindweed haustorium development in pepper roots, pepper xylem (PX), pepper cortex (pc) and pepper phloem (Pp). Penetration of the primary haustorium throughout the host cortex is also evident (Figure 3A); the haustorial tissue is beginning to penetrate the pepper phloem and phylum tissues and destroys the pepper cortex as shown (Figure 3B-3D). The connection of the haustorial xylem (differentiated cells) to the phloem conducts the elements of the host. The xylem of both parasite and host showed a complete contact as shown in (Figures 3E, 3F). Crops suffer enormously from field bindweed which competes for nutrients and water , also an important result that could affect competition and increase weed aggressiveness towards crops in agro-ecosystems. As well known, the direct physiological effects of increased atmospheric CO2 probably will be most beneficial to C3 plants . These facts in agreements with our results about the effects of bindweeds on the fresh weight and pepper plant characteristics measurements and so the disease incidence. Sections prepared from the connecting regions between broomrape and various hosts were subjected to different light sources and stains, and examined by epifluorescent microscope. The entry path of broomrape haustoria through the host root cells and the connection of their vascular elements were followed. The results were similar in all the different hosts, and therefore the connection of primary and secondary haustoria of broomrape to the lateral roots of pea was taken as a model and studied  accordingly results of our sections in pepper tissues are similar to those through the same sequence of bindweed penetration to pepper plants. The vascular xylem of the bindweed primary and secondary haustoria eventually are connected with phloem conducting elements of the host root. By using of light microscope, boundary features of the penetration and connection of the secondary to the primary root (in healthy pepper plants) were compared histologically with those of the haustoria and the host root cells (in infected pepper plants). Greenleaf WH. Breeding vegetable crops. Basset MJ. 1986:67-134. Grubben GJH, El Tahir IM. In: Grubben, GJH & OA Denton editions.2004. Manrique LA. Greenhouse crops: A review. J Plant Nutr. 1993;16(12):2411-77. Tucakov J. Lečenje biljem, RAD-Beograd. Beograd (In Serbian). 1997:717. Holm LG, Plucknett D, Pancho JV, et al. The world‘s worst weeds: distribution and biology. The University Press of Hawaii, Honolulu.1991:98-104. Gianoli E. Lack of differential plasticity to shading of internodes and petioles with growth habit in Convolvulus arvensis (Convolvulaceae). Int J Plant Sci. 2001;162(6):1247-52. Lyons KE. Element stewardship abstract for Convolvulus arvensis L. In:Field bindweed. Arlington: The Nature Conservancy. 1998;1-21. Aneja KR, Srinivas B. Leaf spot disease of field bindweed, Convolvulus arvensis-a new disease record. Int J Pest Manage. 1990;36(1):75. Glawe DA, Windom GE, Grove GG, et al. 2003. First report of powdery mildew of Convolvulus arvensis (field bindweed) caused by Erysiphe convolvuli var. convol­vuli in North America. 2003. Johnson A, Booth C. The plant pathologists pocket book (2nded.) Commonwealth Agricultural Bureaux. 1983. Nassar MA, El-Sahhar KF. 1998. Botanical preparations and microscopy (Microtechnique). Academic Bookshop. Egypt. 1998;219. Snedecor GW, Cochran WG. Statistical methods (8th Ed.) Iowa State Univ Press USA. 1989. Patterson DT. Weeds in changing climate. Weed Sci. 1995;43(4):685-701. Hassan E, El-Akkad SS, Mustafa SM, et al. 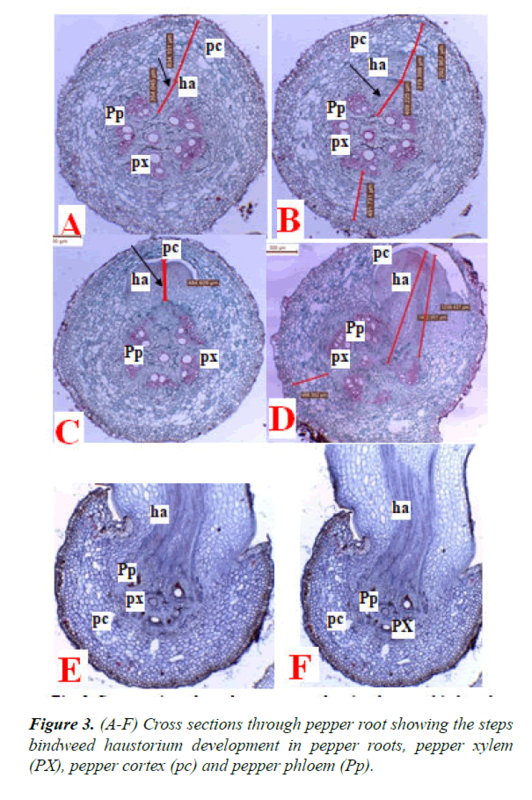 Histochemical aspects of penetration and vascular connection of broomrape haustoria in the host root, and the possible implication of phenylpropanoids. Int j agric biol. 2004;6(3):430-4.